Sam Mulligan: Great Scott TONIGHT! 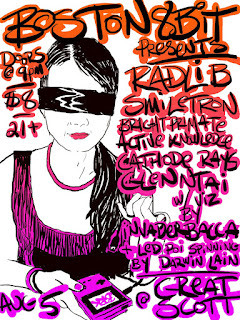 BOSTON8BIT always puts on a good show and this time they've got Radlib, Smiletron, Br1ght Pr1mate, Active Knowledge, Cathode Rays, and Glenntai starting at 9:15 PM. Doors open at 9:00, and if you get there right away you might catch me playing a couple of songs. Visuals by Invaderbacca, NES and SNES freeplay, LED Poi, and it's only $8!